The major portion of the Telugu areas was brought under the control of the notable rulers, Kakatiyas during the 13th century AD. It was during the rule of the Kakatiyas that the area was in its zenith of the various culture like literature, temple art and the fine arts. However after the decline of the Kakatiyas in the 14th century, the Vijayanagar Empire ruled the state till the 16th century. There was a rapid development in agriculture, commerce and arts which reached to the peak during the reign of the Vijayanagar dynasty. The Vijayanagar dynasty was taken over by the Golconda kings, who succeeded in building a strong Hindu-Muslim unity and in fact the Telugus reached their pinnacle in all fields during this period. Though they were the Muslim Kings they still patronized the culture of the Telugu-speaking people and gave them distinguished position in their courts. Andhra Pradesh which has its roots from the oldest of South Indian civilizations is considered to have a high ethnic value divided into various categories as per religious priorities and geographical location. There are lots of communities of the Telugu people residing peacefully for years thus proving high ethnic value of Andhra Pradesh. The state of the Telugu people is the fifth largest populated region of India with dynamic Ethnic groups. Though people from all over India live in this place, the rural area is primarily ruled by the tribes of the Telugu origin. Some of the tribal communities of the telugu people are Gadabas, Koyas, Kolamis, Bhagatas, Khonds, Savaras, Nayakpods,Kondadoras, Valmikis, Jatayus, Chenchus, Yanadis, Balasanta and Davaluru.The Telugu governing bodies are very careful in maintaining a harmonius condition in the state thus avoiding external elements of disruption from not entering even the borders of the state. The Telugu people with a sparkling social structure are a blend of resonant conglomeration of culture and traditions. Having ruled by great Dynasties of the past the people and the state exhibit a mix of rich Nizami tradition and royal heritage. The cultural heritage of the country is contributed a lot by the state and the Telugu people. Being under the rule of various dynasties like the Chalukyas and the Mughals, the culture of the state is beautifully controlled and shaped. The Telugu people are very much influenced by the culture of their roots giving a creative touch of varied civilizations. Its rich culture is discernible in its mellow music, dazzling dances, crispy cuisine, aboriginal arts & and crafts, pious people, religions, and fairs and festivals. The culture has become inseparable from its people for it is adhered by the Telugu people living even in different parts of the country and the world. Muggulu is one of the most common tradition followed by the Telugu people where a threshold design is done at the entrance of the house with white rice powder. But now rice powder is slowly getting replaced by lime stone powder and on special occasions coloured powder is added and then it is called as rangoli. There is a traditional belief of the Telugu people that the kolam keeps away evil from the house. Ugadi is the Telugu new year and on this day people mix cow dung with water and sprinkle it on the ground in front of their houses and many other customs and rituals are carried out on this day. Also many new ventures are started on this day. The Telugu people are patrons of arts and crafts and they are pioneers in the field of metal ware, carpets, wood and stone carving, exquisite silver filigree, brass and sheet metalware. Kalamkari, Bidri, Nirmal paintings, fascinating weaves from Pochampalli, Gadwal, Venkatagiri and a number of other centres have earned a name all over the world. Kalamkari is supposed to be famous worldwide which is done using a quill and printing is done on the fabric with vegetable dye. The Bathik print which is done using wax and prints are made on the fabrics. Bathik prints are used to print in sarees, dress materials and also on wall hangings. Another traditional craft practiced by the Telugu people is the Cherial Scroll paintings done on cloth using earthen colours. The Telugu people and their state are known for hot and spicy food. 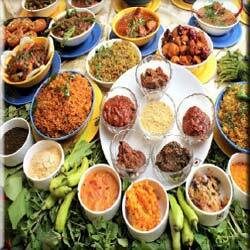 The cuisine of Andhra Pradesh is a blend of Mughlai cuisine. Rice is the staple food of Telugu people where they eat it along with sambhar, lentils and vegetables. No Andhra meal will be without pickles, chutneys, powders, etc., for they form an integral part of their food. Like most of the South Indian states, the Telugu people serve their food on the banana leaf and usually water is sprinkled on the leaf which indicates that the person is ready to eat and food can be served. The main food of Andhra Pradesh is Pulihara, or tamarind rice along with green chillies adding spice to the cuisine. 'Gongoora' chutney and 'Pesarattu' of Andhra is famous worldwide. Biriyani is an important part of Andhra cuisine. A spicy dish made of brinjals known as 'Bagara Baingan' is a notable dish among the Telugu people. Andhra is also known for its chowki dinner. 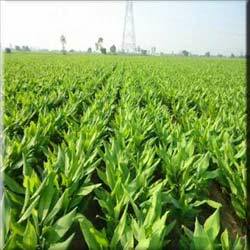 Agriculture is the major occupation of Andhra and nearly 70% of the population is dependent on farming. Rice is the staple food of Telugu and also they are the largest producer of rice in India along with other cash crops like Tobacco, Groundnut, Chillies, Turmeric, Oilseeds, Cotton, Sugar and Jute. However the past few decades is noting an enormous growth in Industries. The HITEC city in Hyderabad is supposed to be the largest Information Technology park in India and was able to offer jobs in various fields like Telecom, Engineering Consultancy and related services. Apart from this there are opportunities in other sectors like sugar mills, spinning and textile mills, electrical, paper and cement manufacturing units.